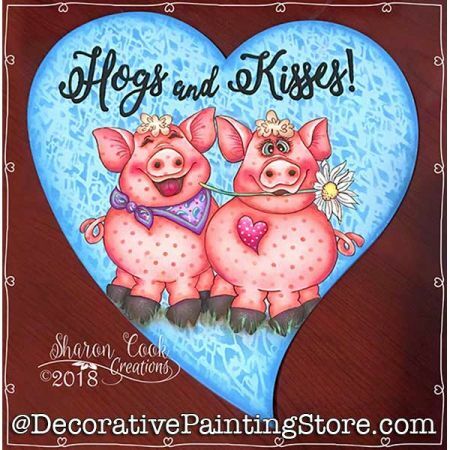 Two pigs painted on whimsical heart plaque - approx. 11-7/8"x13". Have you ever seen a more delightful set of “love-birds” than these two happy hogs? This funky heart-shaped plaque would be a wonderful way to share your love this Valentine’s Day. Imagine how cute it would look attached to a wreath and displayed on your front door. Easy techniques were used to create this piece, so it’s a good project for all skill levels. A bit of dry brushing, stenciling, and basic decorative painting steps are all you need to create this lighthearted piece. Surface available from Creative Arts Lifestyle. Pattern includes finished product photos, instructions, line drawing, supply list.